William S. Ladd, who served two terms of mayor of Portland in the 1800s, was the original owner of the property where the Garden is located. He called it Crystal Springs Farm. The oldest rhododendron in the current garden was planted prior to 1917. The Portland Chapter of the American Rhododendron Society initiated the development of a display and test garden in 1950. Sam Jackson, owner of the Oregon Journal, had donated 27 acres on Terwilliger Blvd. for the garden, but the steep terrain made the site unsuitable. Claude I Sersanous, one of the group assigned to select a new site, suggested the garden's present location in the Eastmoreland neighborhood of southeast Portland near Reed College. Referred to as Shakespeare Island by students at Reed because of the plays performed there, the roughly five-acre site was abandoned and overgrown with brush and blackberries. Through the efforts of the Portland Chapter and other volunteers, and with the support of Park Superintendent C.P. Keyser, the garden flourished. The Garden was established in 1950 by special ordinance from the City of Portland, to be jointly maintained and administered by the Portland Parks and Recreation Department and the Portland Chapter of the American Rhododendron Society. The first planting started in October of 1950 with the transplanting of three 40-year old hybrid Cynthia rhododendrons, which were donated and came from the home of Mr. Keyser. The first rhododendron show was held in 1956. 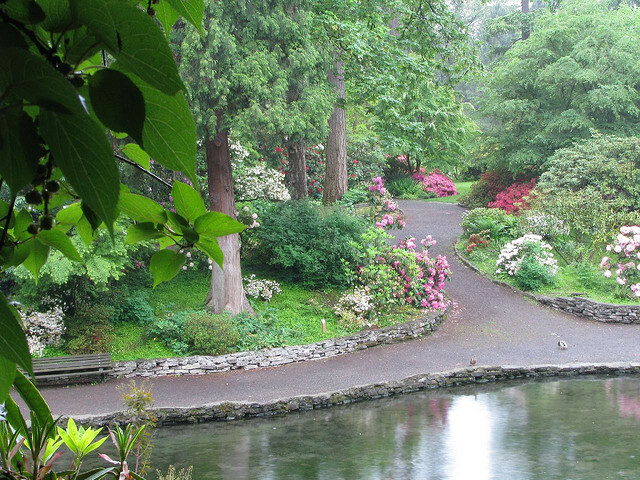 The garden was officially named the Crystal Springs Rhododendron Garden in 1964. The Garden was initially developed as a test garden to replace the one on Terwilliger Blvd. The aims were to evaluate rhododendron over a period of several years, to grant awards to worthy varieties, and to acquaint the public with all kinds of rhododendron, thus serving as an educational as well as scientific project. Lack of security and adequate protection made the testing component of the plan impractical, and that aspect of the concept was dropped. The original garden, on what is now called the Island, was designed by Ruth Hansen, a landscape architect and member of the Portland Chapter. The portion of the garden known as the Peninsula was designed by Wallace K. Huntington, a well-known Portland landscape architect, and was dedicated in 1977. The rocks used to build the waterfalls and other features were gathered from Mt Hood and Mt Adams. The garden paths were redesigned in the first decade of this millennium to bring the park into compliance with the Americans with Disabilities Act. Routes through the park are now accessible by wheelchair. The more than 2,500 rhododendrons, azaleas, and companion plants in the garden have all been donated by volunteers and interested individuals, or purchased with specially donated funds or from the profits of the two annual sales that support the Garden. Beginning in early spring and continuing into summer, the plants provide a magnificent display of color, giving visitors the opportunity to view many varieties rarely seen in the Pacific Northwest. During the fall, many companion trees add dramatic coloring. Spring-fed Crystal Springs Lake surrounds much of the garden, attracting many species of birds and waterfowl. The site provides a beautiful backdrop for the many weddings held here. The Garden is enjoyed by thousands of visitors each year. © All Crystal Springs content copyrighted 2017. Content, including photos, may be reproduced only with permission of the Portland chapter of the ARS.